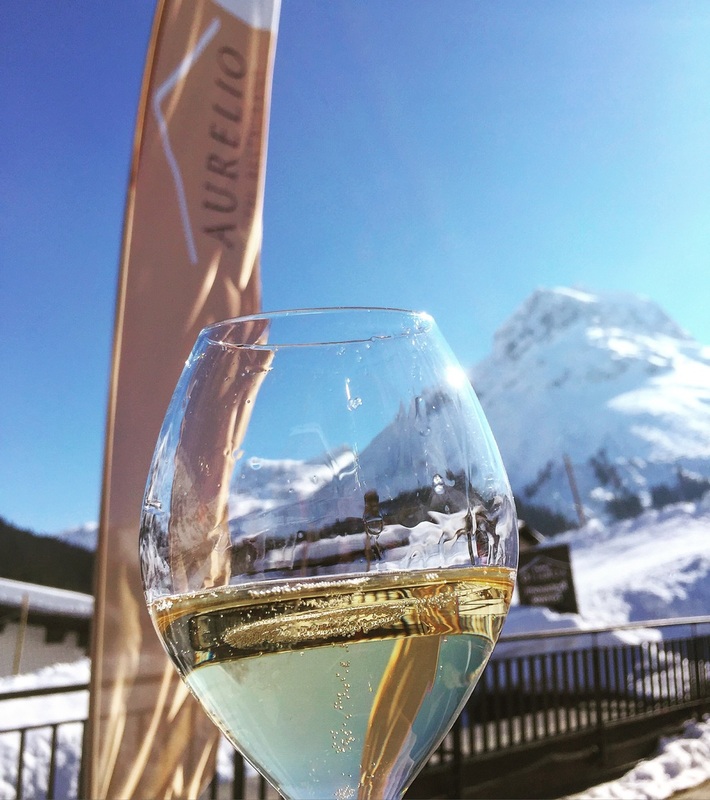 Lech is already well known to be horrendously expensive with hotels such as the Almhof Schneider, the Gasthof Post (where the Royal Family of the Netherlands stays every winter) and the Thurnher’s Alpenhof a bit more southern in Zürs. However all these upscale five-star hotels have been flashed by one property: the Aurelio Lech. Lavish, extraordinary and expensive are the best superlatives to describe this slightly different hotel experience. 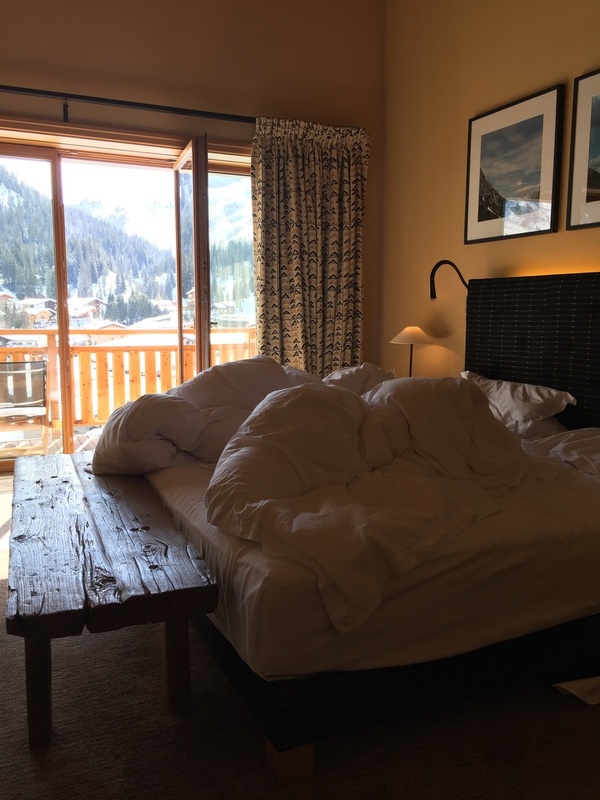 With room rates as high as the surrounding peaks (the average room rate is 2.000 USD per night), this is actually the most expensive ski hotel in the entire world. 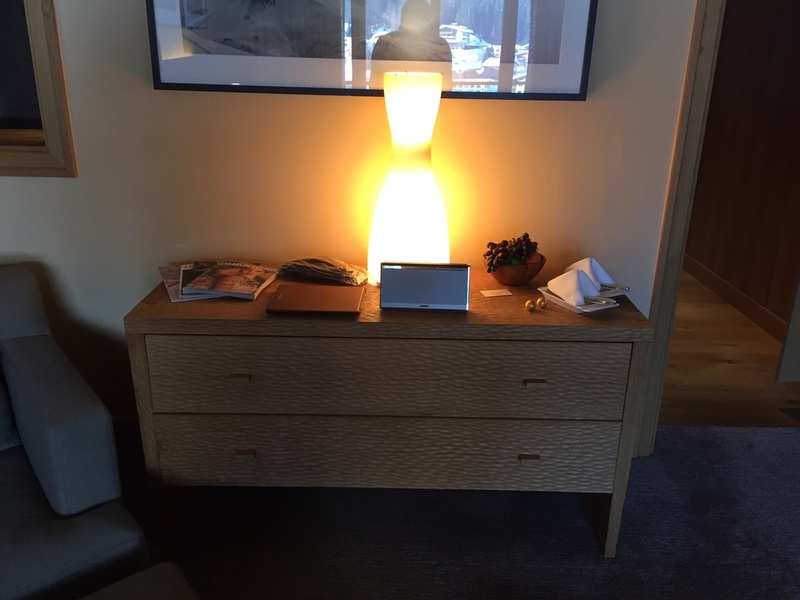 Even Courchevel, Gstaad and the wannabe-luxury resort Andermatt look cheap compared to Aurelio Lech’s room rates. Well, what makes this place a must-go for all hotel-aficionados and millionaires? Driving through Lech is less spectacular than passing St Moritz or Gstaad. No Prada, Gucci or Louis Vuitton shops and the crowds are less fashionable (Moncler ski jackets are quite rare). Well, after passing by the elegantly-looking Almhof Schneider, although we have been confused by a few signs indicating the Aurelio, we arrived nearly on the terrace of our wonderful accommodation. Letting the car behind us and finding the way to the front desk, we were immediately welcomed and offered a welcome drink. 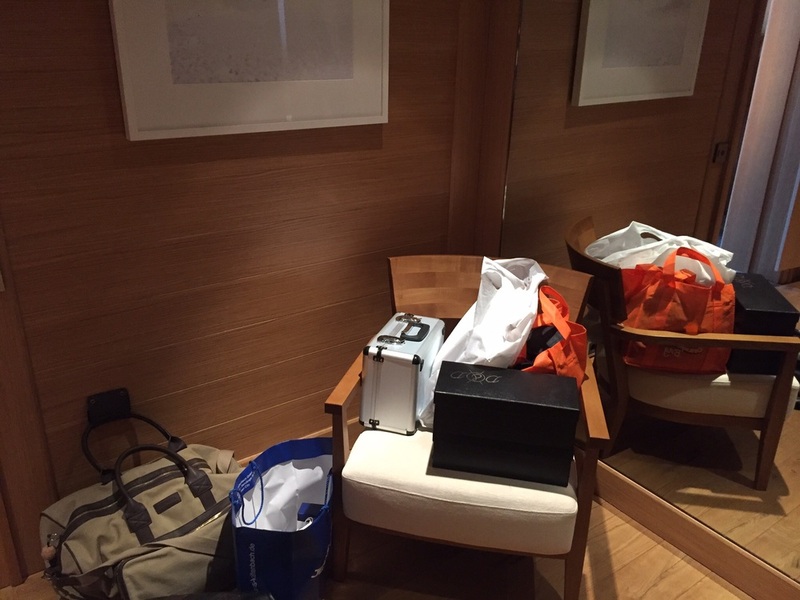 The porter was taking care of the luggage, ski equipment, while two glasses of vintage Veuve Cliquot already arrived beside our sun loungers. Relaxing 30 minutes later, the nice front desk lady (in an outfit by Luis Trenker) accompanied us to our Top Deluxe Room. Although she was super friendly, there was a lack of information regarding the included amenities, such as cake service in the afternoon, the complimentary minibar and the Bentley in front of the house (we still don’t know if it is free for hotel guests or if it is just for showcasing purposes). We also missed a Guest Relations or General Manager who is available for any questions or concerns – when you think of the price category. Back to the room: Vast, filled with daylight, lavish furniture, a perfect design and highest quality when it comes to fabrics and beds. 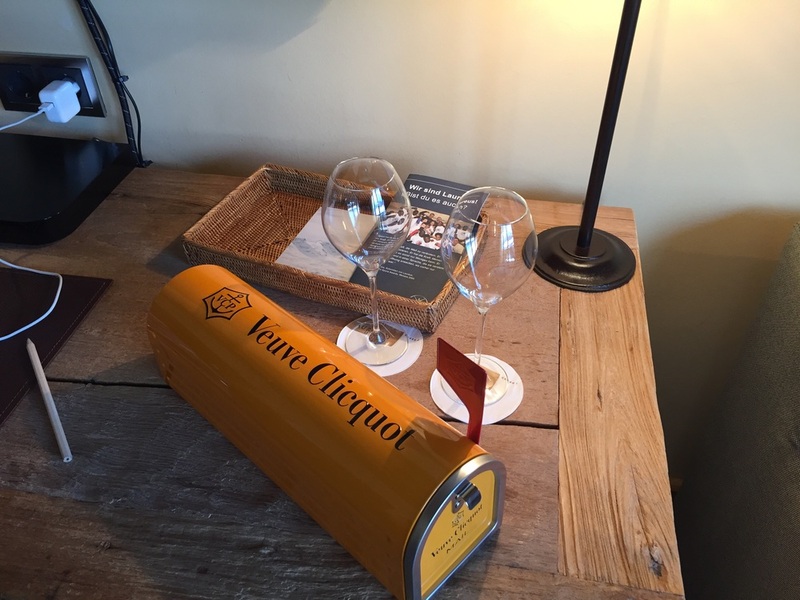 A bottle of Veuve Cliquot as a welcome gift was the biggest difference between the Aurelio Lech and the other high-end hotels we have seen in Europe. 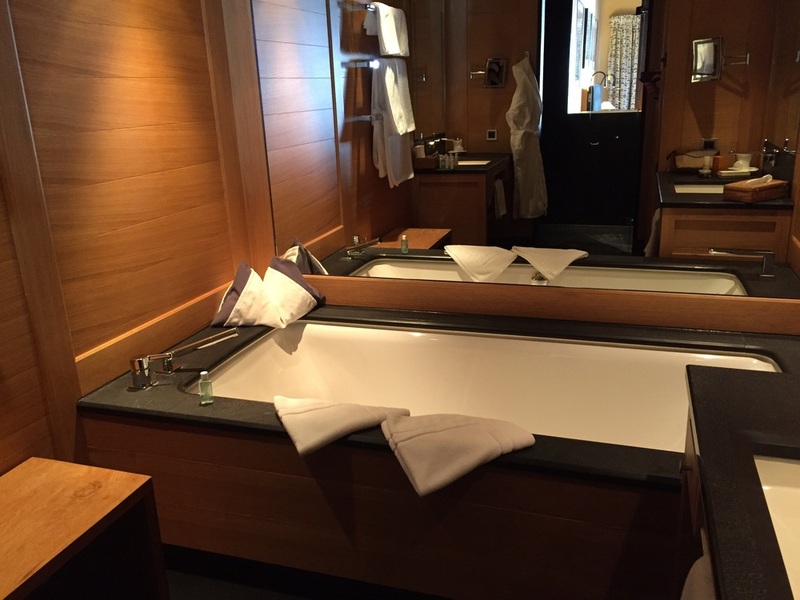 Treca de Paris beds, the most heavenly bed blankets, Hermes Jardin du Nil toiletries, Geberit AcquaClean toilet and a heavy curtain which also looked expensive, were some of the most attractive features of this “slightly different hotel room” as I prefer to call it. An i-Phone Docking station would have been as appreciated as well as a welcome letter. 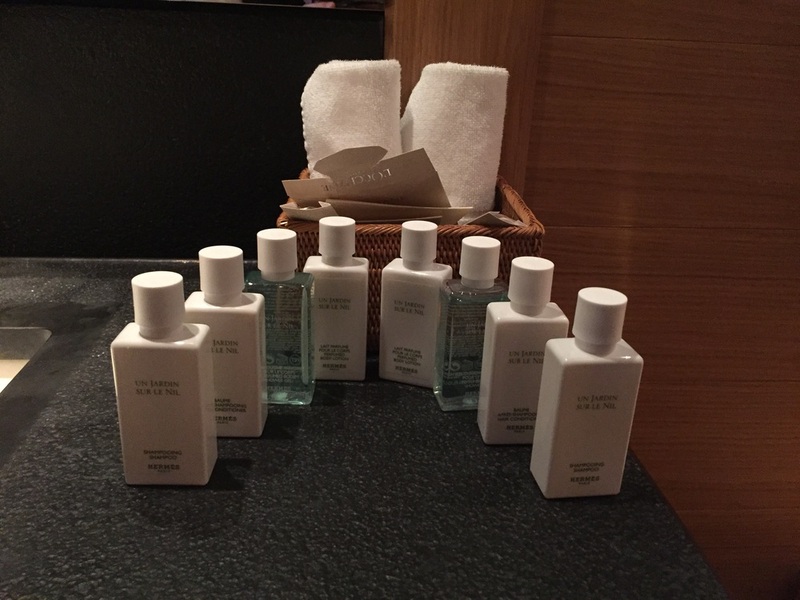 Simple amenities such as shaving kit and dental kit had to be ordered at the front desk – normally things that should already be in the room at such rates. On the first evening, I was trying to take a shower. This idea has been interrupted by the fact that the temperature control fell into my hand – boiling water started to come only. After calling the front desk, a technician came and told us he cannot repair it. Well, we were a little bit upset. 30 minutes and a relaxing bath later, he arrived without notice and repaired it. So all it was, seemed to be a big communication problem. If he would have informed us accordingly, there would not have been a problem (what seems to be normal in big business hotels is not what I expect of a 10-room hotel). Fortunately, this has been the only issue at the hotel, however such a process is not really what we expected. Afterwards we were ready to experience the main highlight: the culinary experience. Guests are served a five-course menu with two options. The complete menu has been excellent without issues and therefore was impeccable. Unfortunately service seemed to be a bit under stress and one server was even swearing at the gueridon next to our table and they did not follow service rules (some dishes have been served from the left side). However the presentation of the food was outstanding and the bread was one of the best we ever had at a restaurant. They have a quite nice selection of wines, although we did not have the feeling that there is an experienced Sommelier on-site and it’s more a fancy-name-listed book (the majority comes from famous wineries such as Ornellaia, Dom Perignon and Chateau Petrus). What disappointed us most, was the lack of personal touch. It would have been easy to call us by our last name (with just 20 guests), tough never happened. I really appreciated the flexible menu options, so I could order an amazing (!) 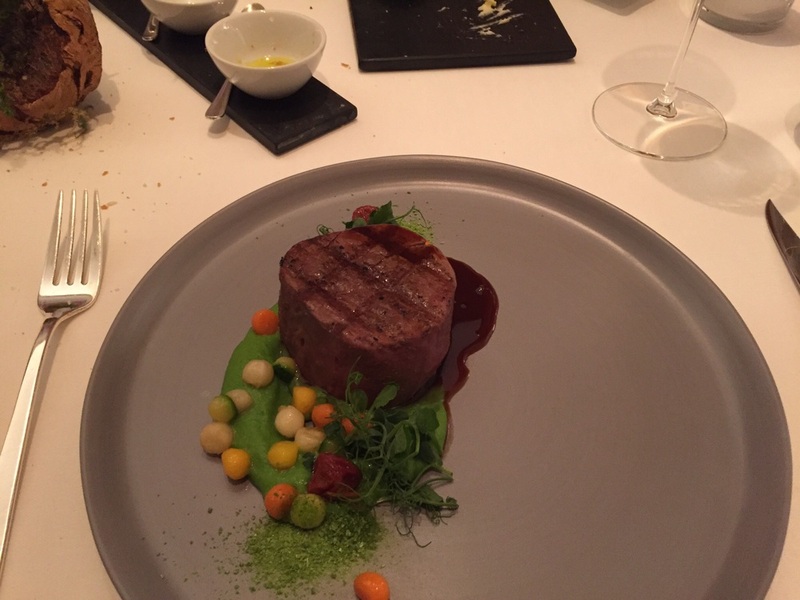 beef fillet instead of escalope viennese style, after all the high food quality came up for the service. Breakfast was served partly on the table and on a small buffet. Service was very friendly and attentive, the quality of the products also excellent. There is a selection of three different butters, a big variety of fruits, excellent bread and jams. There is a breakfast menu in English which states the options for egg dishes. Our scrambled eggs and our omelet have been very good, as the coffee was. The only disturbing thing was that the waiter opened the door to the terrace without asking. As we were beginning to feel cold, we left breakfast earlier. 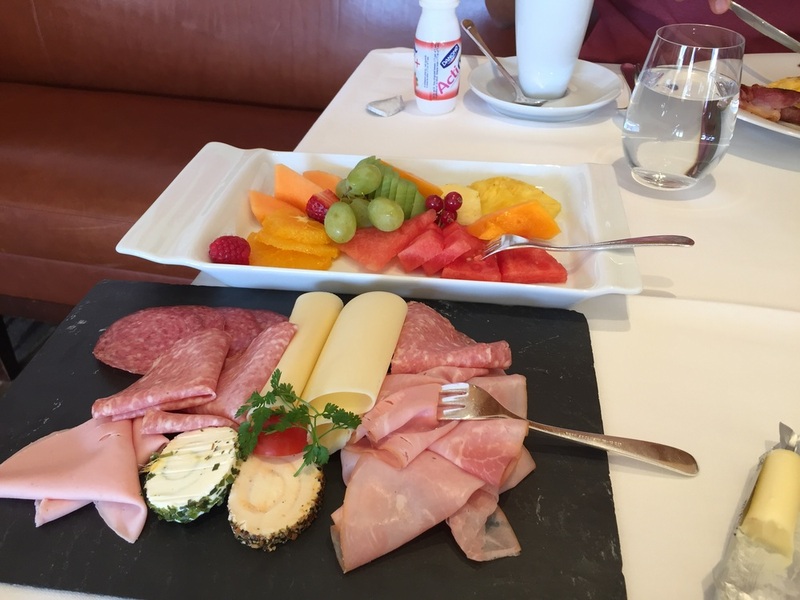 Being a guest who pays more than 1.000 euros for an overnight stay, I do not expect to be rushed at breakfast. Finally we arrive at another highlight: The Spa. With just eight rooms and two suites at the hotel part - there is another spa at the Chalet Club next to the two hotel buildings – the hotel spa is very intimate and definitely something to write about. Top attentive and friendly service, a 23-metre indoor pool (heated at a comfortable temperature and deep enough to practice jumping), a hot Jacuzzi, cold diving pool, two saunas, a steam bath and an experience shower, all these amenities were offered at the hotel Spa. Maybe it’s the privilege of sharing the spa with just 18 other guests which is causing such high room rates. The Aurelio Lech is definitely offering a vast spa to a small amount of guests, a super exclusive design with expensive furniture, amazingly big rooms for European standards, good service, prime location on the main slopes of Lech/Zürs and outstanding food presentations with the best half board dinner and the most amazing cakes we had in a hotel. Last but not least, we have to admit, that for rates between 1.000 and 2.000 euros for one night, we missed the personal touch from the staff as well as the management, but maybe that's what the Aurelio stands for... 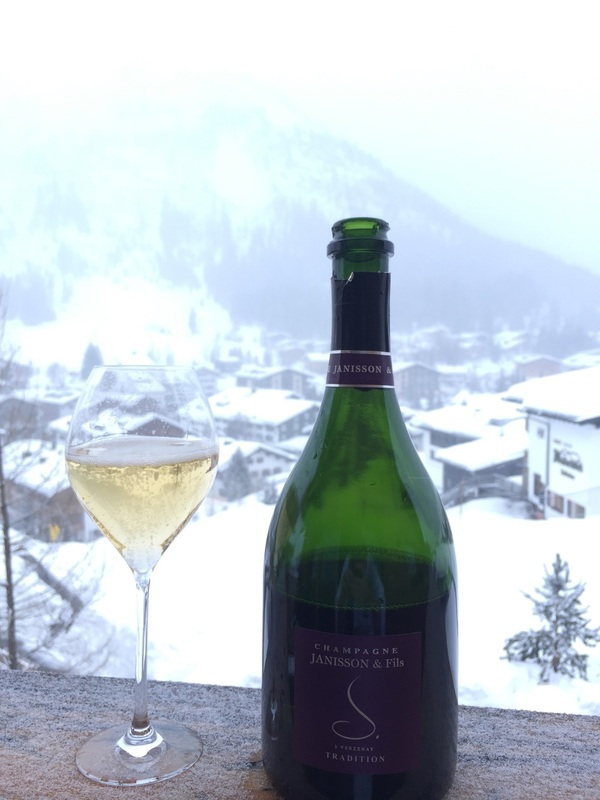 Probably that's what you need to expect when you check in at the world's most expensive ski hotel. 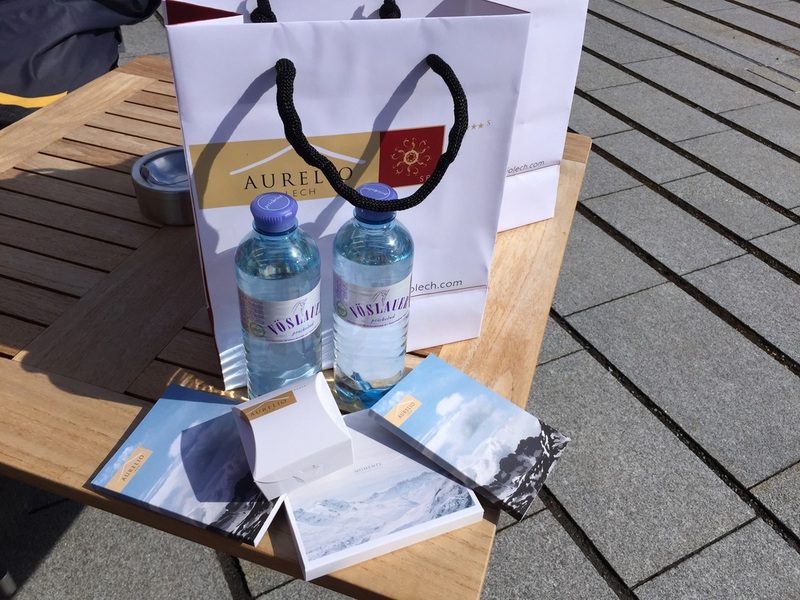 After we checked out, we have been given two give away bags with water, chocolate and a note book. A lovely touch after a wonderful experience to another, very different world. 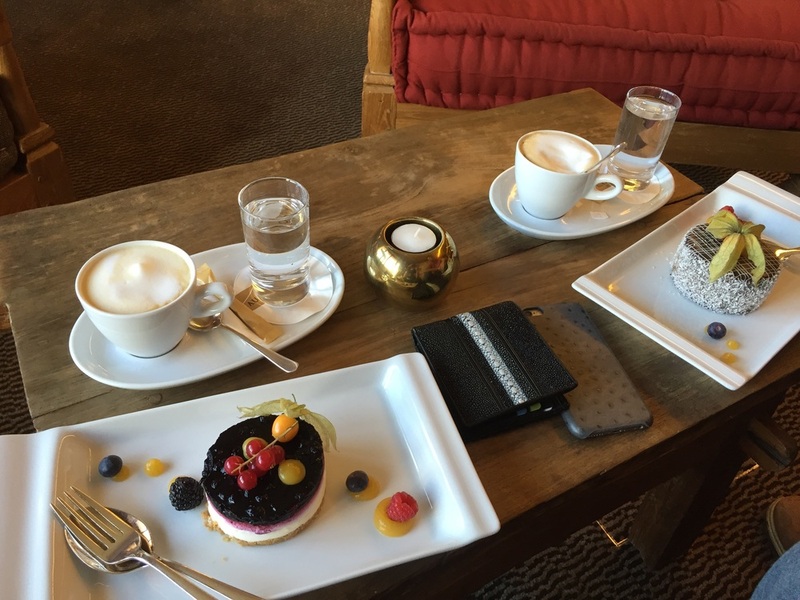 We were guests of the exclusive Aurelio Hotel Lech. However all above written expresses our own opinion and has not been influenced.